The Snow Wall Walk in Tateyama Kurobe Alpine Route! 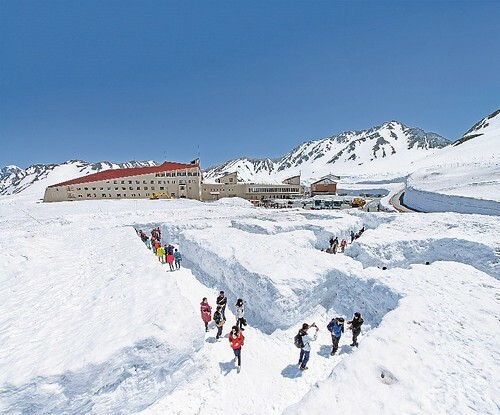 One of the most popular tourist sites (especially among Asian tourists), the Snow Wall on Tateyama Kurobe Alpine Route has opened for the visitors on April 16. It is scheduled to be opened until June 22. Tateyama Kurobe Alpine Route is about 90 km long route that passes through Mt. Tateyama in the Japan Alps. The visitors can either start from Tateyama Station in Toyama prefecture or Ogizawa station in Nagano prefecture. There are different types of transportation provided throughout the route, such as buses, cable cars, and rope-way, and visitors can get off and enjoy activities at any stop along the way. Making a round trip is possible but many go for one way so that they have enough time to spend at each stop. A very convenient baggage forwarding service is available for those who have luggage. So, don’t worry about having to carry heavy bags along the way. One thing the visitors should be aware is that the transportation in Japan are very punctual most of the time. It is advised that visitors check the timetables carefully so that they don’t miss the last service. The most famous spot along the route during this season is the Snow Wall in Murodo. Tateyama has some of the heaviest snowfall in the world. This year, the Snow Wall is 19 m high (as of April 23)! Besides the Snow Wall, there will be Snow Maze from May 9 until 31st, and Snow Slide from June 3 until 22 in Murodo. As the temperature is lower than 10 degrees, it is advised that visitors wear warm winter clothes suitable for snow: Jacket, knit hat, gloves, trekking shoes or boots, and sunglasses. Reservations are not required for the transportation provided on the route, except for groups of more than 15 persons. The tickets can be purchased on the same day at the ticket counter in Tateyama station and Ogizawa station. Tateyama Kurobe Alpine Route has a website in Japanese, Traditional and Simplified Chinese, Korean, and Thai. Check the website for detailed information. *All images: TATEYAMA KUROBE KANKO CO.,LTD. Plan your itinerary with Hyperdia! Free train timetable and route search engine.